The Windows Azure Cloud is expanding its footprint in the Asia-Pacific Region. Microsoft is building a new data center in Singapore, with a facility expected online in 2014, the company has confirmed. 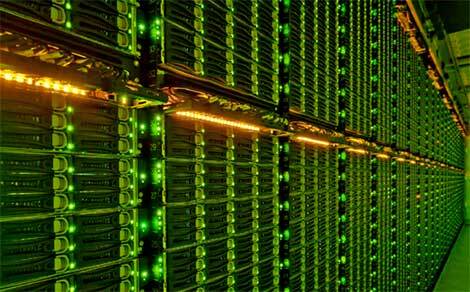 Microsoft also announced two new data center sites in Australia. Racks of servers housed inside a Microsoft data center. The company is planning new server farms in Singapore and Australia. (Photo: Microsoft). The Windows Azure Cloud is expanding its footprint in the Asia-Pacific Region. Microsoft is building a new data center in Singapore, with a facility expected online in 2014, the company has confirmed. No other details are available at this time, beyond the company confirming it is building a major project there. Meanwhile, Microsoft has announced plans for additional data centers in Australia, with new Azure sub-regions in New South Wales and Victoria. These sites will use a geo-redundant configuration, making it easier for customers to back up their data within Australia, meeting rules for "data sovereignty" in disaster recovery. Singapore is perhaps the hottest AsiaPacific data center market, with all the major providers either building or looking for projects there over the last few years. Bottom line: Singapore is the primary hub for AsiaPac cloud going forward. There’s many reasons why Microsoft would choose Singapore as a major data center hub. It allows it to extend delivery of its services to the Asia-Pacific market, where it's currently seeing the highest growth rates. Office365 and Azure are its major plays going forward in the region. All major analyst firms expect explosive growth in the region for cloud services over the next few years, and Microsoft diligently studies where its opportunities lie. Singapore is one of the region's leading financial and business centers, with many customers looking to deploy critical business applications there. However, there’s historically been a limited supply of enterprise data center quality supply, which has lead to most major providers looking to build and set up shop to address growing demand. Singapore also represents a location where many global customers are looking to set up shop. According to the Singapore Economic Development Board, Singapore is currently home to approximately 50 percent of South East Asia’s data center capacity. A look at projects in Singapore over the years also gives indication into the region’s data center boom. First and foremost, Amazon added AWS Singapore making its cloud available in the Asia Pacific Region. Microsoft needs Azure to compete in AsiaPac and can’t do so without a strong, local presence. Equinix is like Starbucks in that it does a ton of research into where it locates its data centers. Its continual investment and expansion in the region is one big indicator of the future of Singapore and its growing prominence as a connectivity hub. It keeps announcing a series of major projects there. Digital Realty Trust purchased a Singapore Data Center in 2010, citing the Asia-Pacific region as the logical target for its next phase of growth. It has seen strong leasing in the region, signing blue chip tenants, IBM, Adobe, and SoftLayer. In 2011, IBM opened a cloud data center in Singapore. While cloud services have been attractive in the past, concerns about the consistency of the service performance due to the potential impact of network latency and the location of the data have inhibited their uptake for anything that was a critical workload. This was the reason IBM chose a location in Singapore. This increased availability of enterprise-class cloud services will underpin the acceleration of cloud services in APEJ as cloud service shifts from the SMB sector to the large enterprise. SoftLayer leases sizeable space from Digital Realty in Singapore. The hosting giant recently gave a few reasons why Singapore was so attractive. There’s also Savvis, BT and NTT Communications, which has a strong foothold in Singapore and surrounding regions. IO announced a partnership to bring modules to Singapore last week. T5 Data Centers, which has facilities in Atlanta, Dallas, and Los Angeles is also looking deeply at Singapore for a wholesale play. Are we forgetting someone? Most likely. There’s a ton of activity in Singapore as it turns into the premiere AsiaPac Connectivity hub. Any cloud provider that wants to win some of the market share in AsiaPac needs a presence in Singapore.